Had to break into the puggy bank. But now we can plan a nice anniversary dinner! It will be 8 years on March 3rd! Gotta love the Coin Star machine!! 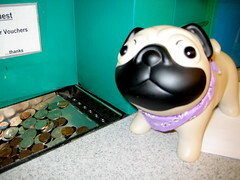 LOVE the pug bank! 🙂 And congrats! Where are you going?